A Wine Connoisseur's Dream Will Come True... With This Wine Display Rack, You Can Accentuate Your Walls and Create a Farmhose Décor. showcase your favorite wine proudly to show everyone that you're a wine connoisseur. Being an expert of good wine is not easy, throw frequent dinner parties to give a little taste of your wine to your friends and family. Wear Your Baby? You can use this multi-purpose wine organizer storage for purposes other than just wine bottles and towels. this set of 4 wall mount racks are perfect for creating a storage solution for your rolled linens and fabrics. Great Gift Idea: This bundle offer is perfect for any occasion or holiday. You can get it for a baby shower, housewarming, Christmas, New Year's or just because. Order today while supplies last and make someone special happy. 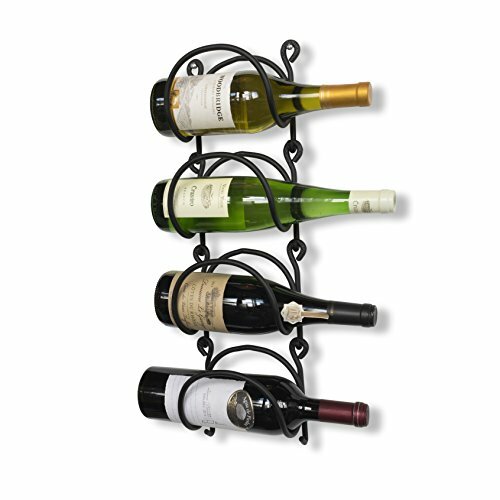 The Wrought Iron Curved Black Wine Rack Will Help You To: Organize and display your wine bottles, towels, baby wearing wraps, table linens and much more. Utilize your walls efficiently and turn your small space into a completely useful storage solution. High-Quality: The 8.5mm wrought iron is heavy-duty and built to last you years to come. Invest in this amazing quality and pay only a fraction of the cost when compared to other brands on the market. Wine Connoisseur? Showcase your discerning taste in wine and prove everyone your expertise in good tasting wine. Always be ready for impromptu gatherings and enjoy throwing dinner parties when your vintage wine collection is displayed beautifully on the wall. Great Towel Rack: Your bare walls have almost unlimited storage and décor potential. Spruce up your bathroom and decorate your blank wall space with your colorful towels. Organize your linen closet and make your walls look decorative with your rolled towels.